I really love the ocean. The air, the sand, the crashing of the waves… I love the feeling of being fully immersed in the beauty of nature. Surfing is meditation for me, I love spending time in nature. I spent a lot of time on my own growing up travelling from place to place, and on my dad’s farm as a teenager. I was always exploring and adventuring somewhere new. 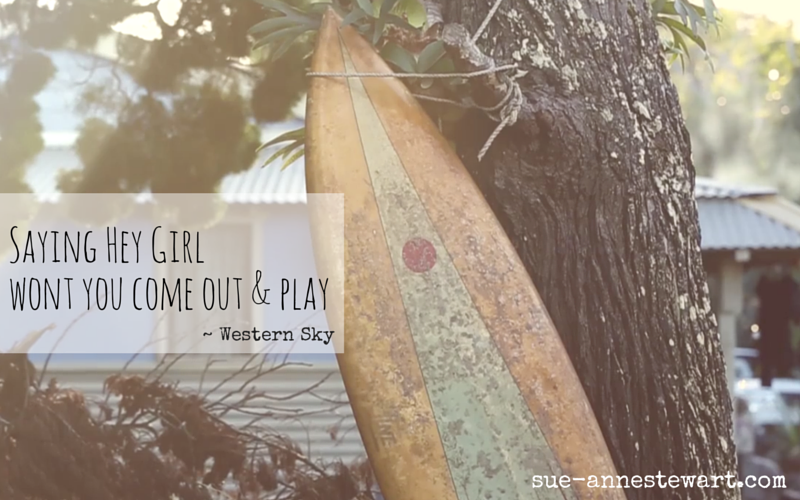 I started surfing when I was 14 when I went to live with my Dad on his farm just outside of Agnes, QLD. I was stoked as I had the best of both worlds. The weekdays at the farm in our little log cabin, spending time playing music, horseriding, and motorbike riding. Then most weekends I would ride my bike along the back tracks to Agnes and go surfing. We lived in tune with the elements at the farm and without electricity. This was the most peaceful time of my life. I loved the stillness and the richness of nature. My first barrel was pretty awesome. This was later on and I remember the day like the back of my hand. I was living at Coolum on the Sunshine Coast and I woke up in the morning with a feeling that today was the day – and it was! I paddled out with confidence and determination. The next thing you know I felt the wave coming in and I was on it! I could see the Coolum Surf Club clear through that barrel. I’ll never forget that feeling! Being by the ocean is still really important to me, how could it not be after spending so much time by the sea as a kid – fishing, swimming and surfing… I love it. Even when I’m travelling with my music I will jump on a board any chance I have. Over the past month while I’ve been playing gigs in Bali and Sydney it’s been so awesome to catch some waves. The other thing I love about surfing is the people you meet. Surfers are just awesome people! No matter where you are there will always be a friendly smile and someone to chat to. The ocean inspires me. It’s power, unpredictability and it’s ability to nurture. It’s inspired my music and I have a collection of ocean rifts that I’m yet to share with the world… just like catching a wave, it’s all in the timing!